Berjaya Makati Hotel offers sumptuous stays, uncompromised convenience and an ideal location from which to explore the city. An urban sanctuary for both business and leisure travellers, Berjaya Makati Hotel in Manila, Philippines offers accommodation of sumptuous comfort and uncompromised convenience where guests can rest and unwind after a long busy day out and about in the city. 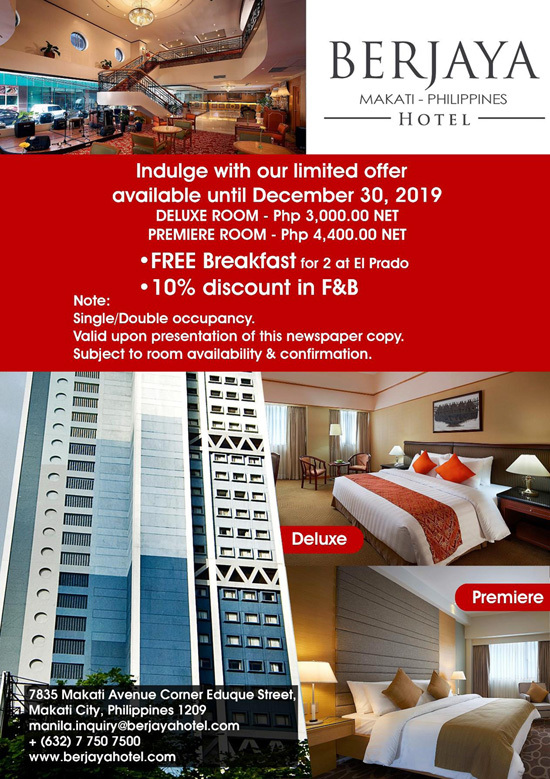 Berjaya Makati Hotel features five categories of rooms and suites, ranging from the elegantly simple Deluxe Room to the premier classy Executive Suite. All rooms are tastefully furnished and designed along contemporary lines. Each is equipped with cable satellite TV, in-room safety box, mini bar, and more. Berjaya Makati Hotel’s food and beverage outlets cater to discriminating taste buds. El Prado, the hotel’s main dining venue, features Filipino and international cuisine, including an extensive lunch buffet. For Small bites, head to El Paseo. Finally, wind down at Las Ramblas for cocktails set to relaxing mood music from daily select bands. Halal Kitchen at Berjaya Makati Hotel are certified Halal by HICCIP (Halal International Chamber of Commerce and Industries of the Philippines). Guest services and facilities include foreign currency exchange, concierge, car rental, laundry, massage (upon request), gym and gift shop. Major credit cards and travellers’ checks are accepted.